We are now proud to be able to offer same day RUSH delivery to customers within a 200 mile radius of our warehouse on all items stocked in our Lee, Fl location. Deadline for requesting Same Day Delivery is 11:00am EST. There are always exceptions to the rule, contact us and we will see if an exception can be made for requests made after the deadline. 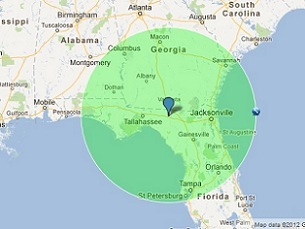 Our new Same Day Delivery Zone covers approximately 50% of Florida, 50% of Georgia, with about 15% of Alabama and 1% of South Carolina all being eligible for Same Day Delivery on all items stocked in our Lee, FL location. See our FAQ's page for more details at the top of the page. Shipping prices shown on our site are for the most economical method of shipping, Ground. Ground Shipping usually consists of one or more of the following services; USPS, FedEx Ground or UPS Ground. Average delivery is 3 Business days. Expedited Delivery options are available Nationwide, but not advertised on our site, since pricing varies from State to State and based on size and weight of package. Contact us for pricing on the following services; Next Day, 2nd Day, and 3rd Day deliveries all Guaranteed Services. (With exception to weather delays, weekends, and Holidays).